Are you in or near Bedford, NH and need asphalt repairs? Whether you need cracks sealing service or you are looking for sealcoating, G-Force can help. We would be pleased to provide you with a no-obligation quote on our services. The sooner a crack is dealt with, the better the chances your asphalt repairs will be minimal. We would be happy to provide you with a fast, competitive quote. We serve commercial, industrial, and residential customers in Southern, NH, Seacoast, Northern, Western, and Central, MA, the Greater Boston area, portions of Rhode Island, and Eastern, CT. We are known as a Bedford headquartered company with a franchise model by and for veterans. When you hire G-Force for your sealcoating or pavement repairs, you’re choosing to put veterans to work. We have a franchised model and every one of our locations is owned and operated by a professional and skilled veterans who care about quality tools, paints and workmanship. We get great reviews from nearby homes and businesses who appreciate our professionalism, uniformed service providers, and attention to detail. Whether you are in Bedford or nearby, we look forward to providing you with a quote on our services. Line striping, repairs, sealcoating, and sign installation are our specialties. Hire a vet today. Contact us or fill out our quote form for more information. Are you a veteran interested in your own G-Force franchise? Feel free to get in touch to learn more about our business model. 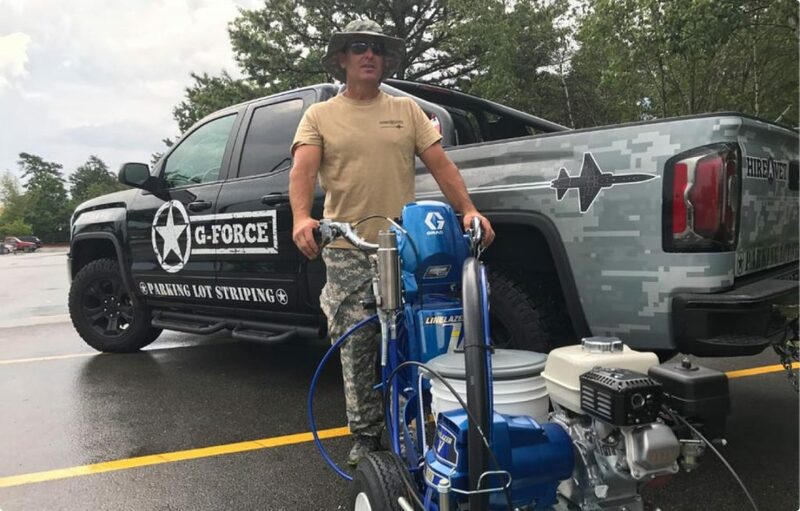 G-FORCE™ is a veteran-focused franchise providing expert Parking Lot Striping, Pavement Marking, Sign Installation Services and more. Our trained, uniformed crews are neat, reliable and dedicated to First Class customer service and expert results.